The creative design of the dial reveals an unusual read out of the time. The 12-hour indication is divided into 4 quarters at the 4 corners of the dial with the minute indication set in the center, hence the name, inspired by the 4-quarter reading format, "Quarta". Each quarter represents 3 hours, when the time-tracking in one quarter is finished, the hand will return back to the starting position and the next 3 hours will be tracked by the next indicator in the next quarter and so forth, like a relay time-tracking system. The see-through case back reveals the automatic moverment of the watch. 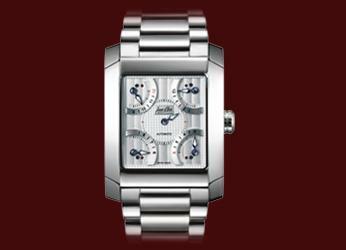 This model is available in black or white dial colour, with stainless steel bracelet or alligator strap.